Without hesitation, first do two things: call your veterinarian, and put the horse in quarantine, (i.e.. isolate it from other horses) as it’s highly contagious. The vet may test to confirm the presence of the bacteria (remember the throat swab the school nurse used to do...? This is worse - think nasal culture...) he or she will likely immediately start the horse on a course of injectable penicillin or something related to that. They’ll also likely administer an NSAID, or anti inflamatory of some sort. There are some alternative treatments out there, but tried and true sure has it's merits. Your veterinarian will likely direct the owner/manager about their role in the treatment, and will include isolation for up to 6 weeks (keep in mind that this is really tough on a social herd animal, and that it’s important to **keep everything for the horse separate** - brushes, buckets, water source, tack, halters and ropes, even pitchforks/shavings forks and manure buckets). The horse will feel pretty terrible - so things you can do to help this along include offering soft feed - something like a warm bran mash made with ingredients not too different from his normal diet, applying gentle warm moist compresses around the swollen glands to speed up their maturation (these will eventually open and drain - and remember that what comes out of them is not only messy and a bit gross, but also contagious - so keep it out of contact with anything that will ever been in contact with another horse). Your vet will tell you when the horse can safely be out of isolation/quarantine, generally after it has had 3 or more swabs that are clear of the infection. The good news is that most horses that get it will develop an immunity to it… the bad news is that some horses will develop the disease again because for whatever reason they didn’t produce the antibodies against it… so keep an eye out even if they’re better. You’ll see advice out there that just says to let it run it’s course, the logic being that it’s much like having a chicken pox party… but to be honest, the severity and cost of the spread of this disease is not worth the risk to horses across the boards, and that advice may be in danger of being a bit irresponsible. If you ever see a horse with a moderate case of it, you'll know it's not worth the risk of having it twice in your barn. Definitely talk to your vet about it. Thankfully, although it has been around since the Middle Ages, strangles are quite rare, because prevention is quite straight forward. First - inoculate! 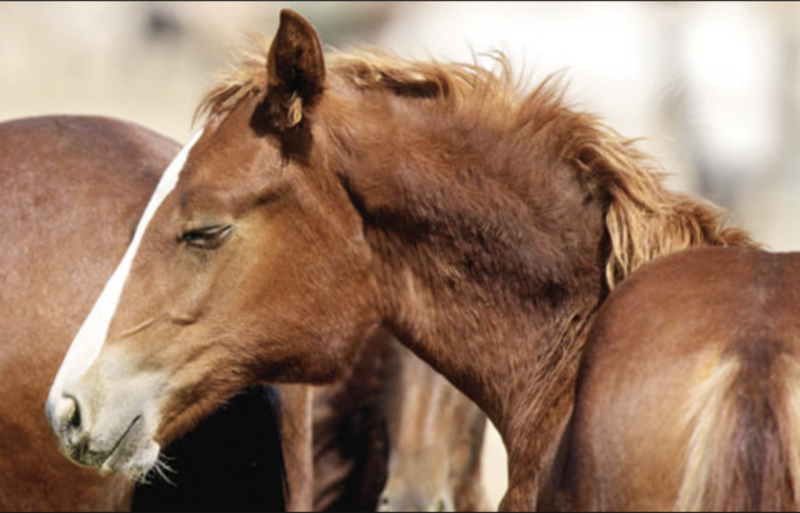 The vaccine for Strangles is super simple - it's done intranasally (a spray up the horse's nose) There is a vaccine making the rounds in Europe that is done as an injectable into the horse's lip... but that just opens a whole new can of worms. Second: quarantine new unknown horses that come to your farm for 3 weeks, employing the same clear horse practices listed above. Third: If you go to a show, keep your stuff clean, dedicated to your horse/barn and be militant about not exposing your equipment to outside horses. For more in-depth information and to access our growing library of complete equine management information, live and recorded webinars that include Q&A, interviews, access to more courses and easygoing community of horse lovers, We'll be opening the doors for The Complete Horse Membership for a limited time.